The Therapeutic Goods Administration (TGA) administers the Therapeutic Goods Act 1989 (the Act), applying a risk management approach designed to ensure therapeutic goods supplied in Australia meet acceptable standards of quality, safety and efficacy (performance). The work of the TGA is based on applying scientific and clinical expertise to decision-making, to ensure that the benefits to consumers outweigh any risks associated with the use of medicines, vaccines, medical devices and biologicals. The TGA considers the benefit-risk balance for the intended population that the therapeutic product is to be used in. The benefit-risk balance for the individual is a decision usually made by health professionals in consultation with each patient and takes into account additional factors such as previous treatment, disease severity, alternative therapeutic products/treatment options and patient preferences. Once a therapeutic product is approved, the TGA continues to monitor the product in the market through therapeutic product vigilance activities. The aim of therapeutic product vigilance is to continually monitor and evaluate the safety and efficacy (performance) profile of therapeutic products approved in Australia and to manage any risks associated with individual products. Therapeutic product vigilance should provide a mechanism for involving consumers and health professionals in the provision and the appropriate use of safety information related to therapeutic products in Australia. The requirement for specific vigilance activities will be for the purpose of protecting the health and safety of Australians and will in no way result in the reduction in a product's requisite efficacy (performance) and safety. It is well recognised that therapeutic product vigilance needs to occur throughout a product's lifecycle to take into account the entire body of evidence that accumulates throughout the lifecycle of the product. The TGA has committed to aligning its regulatory approaches related to therapeutic product vigilance, wherever possible, with those of comparable international regulatory counterparts. This includes a commitment to the integration of internationally harmonised vigilance tools which provides the vehicle through which international work and information sharing can proceed. The TGA will provide regulated parties with guidelines to follow vigilance best practices. The adherence of industry with vigilance requirements is also monitored by the TGA. Therapeutic product vigilance activities are guided by two key components: transparency and timely decision-making; and meaningful public involvement. The TGA recognises that therapeutic product vigilance activities may change over time as knowledge of a product evolves. A product's vigilance requirements should be subject to reconsideration over its lifecycle, on the basis of the evolution of knowledge, technology, best practice standards and society's expectations. Also, therapeutic product vigilance tools will be evaluated for effectiveness in carrying out their desired purposes. The maintenance and improvement of health and safety is a shared responsibility. In addition to government and regulated industry, health professionals, patients, consumers and their respective associations play an important role in reporting therapeutic product safety-related issues. Sponsors have the primary responsibility for the safety of any therapeutic products they import, supply or export from Australia. Sponsors must comply with legislative requirements for therapeutic product vigilance under the Act and there are applicable offences and penalties for not complying. The legislative requirements for therapeutic product vigilance vary depending on the type of therapeutic good. Further information on the legislative requirements for sponsors is available in the Pharmacovigilance responsibilities of medicine sponsors - Australian recommendations and requirements (Pharmacovigilance Guidelines), Australian Regulatory Guidelines for Medical Devices (ARGMD) (Part 3 - Post-market) and Australian Regulatory Guidelines for Biologicals (ARGB). The TGA maintains up-to-date safety information on therapeutic products that is communicated through a variety of means to health professionals, patients and consumers. The TGA is committed to advancing public health through the market authorisation of beneficial, innovative therapeutic products and by providing timely, evidence-based and authoritative information to allow consumers and health professionals to make informed decisions. The TGA is responsible for taking appropriate action, when necessary, regarding the maintenance, amendment, suspension or cancellation of product registration, listing or inclusion in the Australian Register of Therapeutic Goods (ARTG). The TGA is also responsible for operating Australia's therapeutic product vigilance system, ensuring that methods are in place to receive and manage vigilance data, monitor and evaluate that data, and manage the risks. Health professionals, patients and consumers are encouraged to inform the TGA of any problems they encounter (hazards, adverse events, malfunctions, and non-compliance) with regulated therapeutic products throughout their lifecycle, including products used in a clinical trial setting. Information on how to report problems to the TGA can be found at 'Report a problem'. The TGA seeks to promote high standards of therapeutic product vigilance for the protection of the health and safety of Australians, and to facilitate access to products vital to the health and wellbeing of all Australians through a 'lifecycle approach' to product monitoring and vigilance. The lifecycle approach recognises that clinical trial data used to evaluate a therapeutic product for entry on the ARTG is limited and that real-world experience can identify previously unknown safety and efficacy information such as interactions between drugs, between a drug and a medical device or between a medical device and a biological, and provide information about rare and uncommon adverse events. The TGA's product vigilance system consists of an integrated set of product vigilance tools that work together to protect the health and safety of Australians. This includes tools for ongoing benefit-risk information collection, monitoring, evaluation, and management from the development stage through to initial marketing and continued supply of a therapeutic product in Australia. The TGA is working towards integration of internationally harmonised vigilance tools that will strengthen the current system and facilitate international work sharing and information sharing arrangements. Additionally, the TGA has established strong links with regulatory counterparts through participation in a wide range of international fora. Examples of this include the TGA's involvement in the Australia-Canada-Singapore-Switzerland (ACSS) Consortium, which was formed in 2007 to promote greater regulatory collaboration, the International Coalition of Medicines Regulatory Authorities (ICMRA) and the International Medical Device Regulators Forum (IMDRF) which focuses on regulatory harmonisation of medical devices. The TGA is vice chair of the ICMRA and project lead on its Pharmacovigilance strategic priority project. Further information is available in the TGA's International web page and its 2016-2020 International Engagement Strategy. Product vigilance (PV) tools are defined by the World Health Organization (WHO) as tools used to detect, assess, understand or prevent adverse events or any other health product-related problems. For the purpose of the TGA, therapeutic product vigilance tools are defined as tools designed to facilitate the collection and evaluation of information pertaining to the benefits and risks associated with the use of therapeutic products. A description of the product vigilance tools in use or in development is found in Table 1. Summary of the known important safety information about the therapeutic product (safety specifications). Plans to identify and characterise known or potential safety concerns (pharmacovigilance plan) and to minimise any identified or potential safety risk (risk minimisation plan). High-risk medicines may require an assessment of benefit. Reports on harmful and unintended responses to medicines, vaccines, biologicals and medical devices marketed in Australia or in clinical trials. Expedited reporting of serious unexpected clinical trials adverse events. Reports regarding deficiencies in labelling, instructions or packaging, defective components, performance failures, poor construction or design of medical devices marketed in Australia. Pharmacovigilance Inspection Program (PVIP) Inspection of a medicine sponsor to assess whether they are meeting their pharmacovigilance responsibilities. Environmental scanning Collection and review of scientific and medical literature, media reports and regulatory news from Australia and overseas to identify safety issues that require further investigation. With the increased volume of signals of potential safety issues being identified by the TGA, a risk-based process has been developed for the screening and prioritisation of signal investigations being undertaken. This process provides a solid and consistent rationale for allocation of resources towards significant issues and ensures that the TGA can respond appropriately and in a timely manner to emergent safety issues. Signals are prioritised based on frequency and/or severity of the adverse event, plausibility of a causal association (medicine), the detectability of the event if the situation recurred, whether any regulatory action could be taken to help manage the risk as well as the likely public health impact of any regulatory action. However, all identified issues are recorded, and if regulatory action is required this will be undertaken within a timeframe appropriate to the impact on public health. As outlined in Table 2, there may be different requirements for a new product where there is limited information for real world usage. The different product vigilance tools use prioritisation matrixes as guides for the request and processing of safety and effectiveness information submitted to or gathered by the TGA. All adverse drug reactions reported to the TGA are entered into the TGA's adverse event database. Reports of serious adverse reactions are reviewed following a risk based approach and, if necessary, followed up for further clinical or laboratory information to assess causality. All reports received (serious and non-serious) are used for ongoing monitoring of a medicines safety. For example, internationally recognised methodology such as proportional reporting ratio (PRR) analysis is regularly applied to reporting data to detect trends or clusters. Any emerging safety issues identified from adverse reaction reports will be prioritised based on risk and further investigation may occur. For medical devices, all adverse event and complaint reports are entered into the TGA's adverse event database for medical devices. Non-serious reports are used for trending purposes. All adverse event reports follow an electronic workflow process with priority reports having the most stringent timelines. Prioritisation is based on levels of risk or uncertainty – products we know little about (high level of uncertainty) and those that are known to have significant risk. applications to change the registration of a drug, where the change will result in different dosage forms, a change in the treatment population or a change in the safety profile of the drug. The TGA can request a RMP be submitted for therapeutic goods that are already approved and on the ARTG when a safety issue arises. Sponsors are encouraged to review the European Union (EU) Guideline on Risk Management Systems for Medicinal Products for Human Use (EMEA/CHMP/96268/2005), which outlines when a RMP is required. PSUR/PBRER Prioritisation is based on levels of risk or uncertainty – products we know little about (high level of uncertainty) and those that are known to have significant risk and is dependent on the RMP process. The prioritisation scheme aligns with the RMP process. Higher risks could result in more frequent reporting. Annual reporting for medical devices High-risk medical devices that are new to the Australian market are monitored for seriousness of adverse event reports and complaints. Review of data may trigger further investigation or additional conditions of inclusion on the ARTG or other regulatory action. PVIP The TGA use a risk-based approach to prioritise pharmacovigilance inspections. Risk will be assessed based on aspects relating to the sponsor, product profiles, pharmacovigilance systems, previous inspections, and any other relevant factors. PVIP is modelled on the TGA's GMP inspections and the UK Medicines and Healthcare products Regulatory Agency (MHRA) inspections. Therapeutic product vigilance evaluation involves the ongoing assessment of the benefits and risks of a product (including data from adverse event reports, clinical trials, meta-analysis, observational studies, etc.) and the assurance that benefits outweigh the risks for a given population during clinical trials and following its entry in the ARTG. The TGA has developed an approach to a benefit-risk assessment based on consultation with international regulators and other relevant agencies. Benefit-risk assessment is an important regulatory tool that highlights the benefits and risks of therapeutic products. Industry may be responsible for developing benefit-risk assessments in some cases and the TGA's responsibility is to evaluate these documents and other relevant information when a change in the product's benefit-risk profile is identified. The TGA uses both qualitative and quantitative methodologies when performing benefit-risk assessment reviews and also engages collaboratively with international stakeholders such as the Council for International Organizations of Medical Sciences (CIOMS) and other regulators to refine these methodologies. The TGA may seek advice from a range of advisory committees – including the Advisory Committee on Medicines (ACM), Advisory Committee on Medical Devices and Advisory Committee on Vaccines – on the safety, risk assessment, risk management, effectiveness and performance of relevant therapeutic goods. The TGA communicates its monitoring and evaluation of information related to the safety and efficacy of marketed therapeutic products through a variety of means. The TGA publishes Australian Public Assessment Reports (AusPARs) which outline our evaluation of recently registered prescription medicines, including important efficacy and safety information. In addition, the TGA publishes the Product Information (PI) and Consumer Medicine Information (CMI) for prescription and some non-prescription medicines. New safety information is shared with the public and with health professionals through safety alerts published on the TGA's website and the bimonthly Medicines Safety Update (MSU) and Medical Devices Safety Update (MDSU). Information in the publicly searchable Database of Adverse Event Notifications (DAEN) comes from reports made to the TGA by a wide range of sources, including sponsors, health professionals and consumers. Reports received by the TGA up until three months prior to the date of access are available to the public from the database. The System for Australian Recall Actions (SARA) provides consumers, health professionals, sponsors, wholesalers, hospitals and retailers with access to information about recall actions occurring in Australia for therapeutic goods. The database holds information on recall actions that have been undertaken in Australia since 1 July 2012. The TGA shares vigilance data with state and territory health departments and other partners such as the National Centre for Immunisation Research and Surveillance (NCIRS) and also provides adverse event information to the WHO and overseas regulatory agencies through formal (for example targeted emails, regular meetings with key international counterparts) and informal (for example direct communication with international colleagues by email or phone) channels. The TGA incorporates international standards and best practice on various aspects of an integrated product vigilance system. The vigilance systems in place in Australia are designed to allow ongoing monitoring of products throughout the products lifecycle. 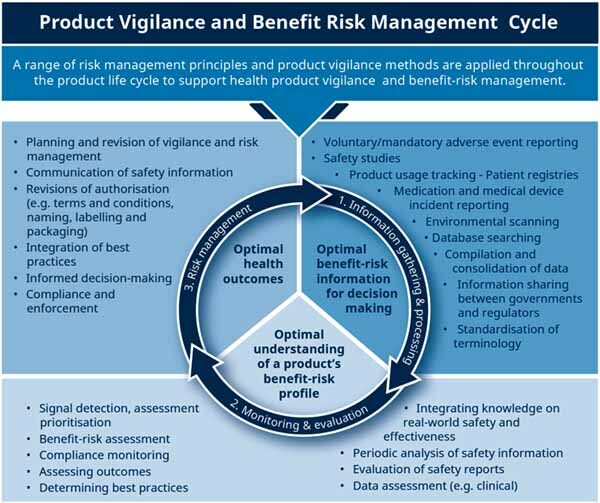 Vigilance systems relating to products in the Australian context must take into account the overall public health impact, as well as practical considerations such as burden to the Australian regulatory system, the Australian health system and sponsors when deciding on steps forward for implementing product vigilance requirements.